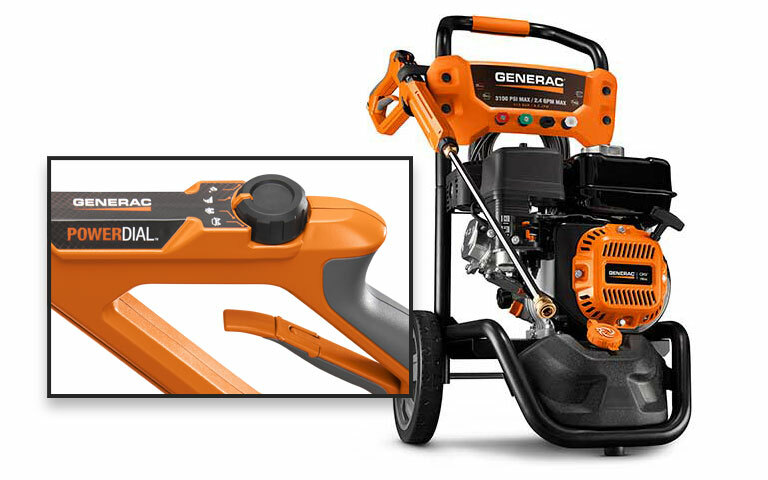 With its large Generac OHV horizontal shaft engine and easy-access axial cam pump, the 3100PSI pressure washer is ideal for cleaning everything from patio furniture to siding to decks around the house. Convenient on-board ½ gallon detergent tank for hassle free cleaning. Rated 1 out of 5 by Daniel from Breaks after minimal use Blew a piston in after owning for only 16 months and I use occasionally. Since labor is out of warranty it is cheaper to buy a new one. Save your money and buy a different brand. Rated 4 out of 5 by Don from so far so good so far so good only used it once hope it will handle the Florida mold/mildew humidity! Rated 5 out of 5 by Zach from AWESOME!!! I got this pressure washer following hurricane Florence to help clean up my house. It not only did the job on what the hurricane left behind, but I also did my whole house, deck, and driveway. The driveway hadn't been cleaned since it was poured over 40 years ago and went from almost black to white! I was able to do a 12 by 30 deck, siding and brickwork (with gunk from 50 years) all with stunning results. This is my first pressure washer and the dial on the handle gave me more confidence in what I was doing. I highly recommend! Rated 5 out of 5 by Ulrich802 from Well laid out design I shudder when I think about using gas powered devices. I by no means am a small engine mechanic. I needed a pressure washer and did some research. The 7019 kept coming up consistently highly ranked among other brands. The manual was easy to follow. Setting up the unit was straightforward. The attachment points are easy to get to and oversized knobs on the high pressure hose make gripping easy for attaching and un-attaching it. It was nice that Generac supplied the first oil supply in an easy to use pouch. Okay, it's all hooked up, time to pull the starter. The manual says to move the choke to the closed position. After six or seven pulls nothing. I moved the choke to open, it started on the second or third pull. A few seconds later I moved the choke to closed and it ran fine. Now I start it this way, and it starts easily (usually the first pull) I have used several tips and I like the adjustable wand. It is a powerful machine! I wish the way the wand was kept on the machine was done in a more secure way. The way it is now it just sits in a holder and if moving the machine over rough terrain it flops around or can even bounce out of the holder. So I just carry it. The wand is wonderful. I never got tired of gripping it. Having adjustable spray tips allowed side to side cleaning or "pushing" the dirt like a broom. It also made it easier getting up under low areas of the deck much easier. It was well balanced. I wish it was four inches longer or so. I guess the length is determined by design to maximize pressure and ease of use. At 5'8" tall, occasionally I had to take a break and stretch out my back. Tall people, be aware! The hose is decent length and lightweight. It was a "drag" on the wand. And the unit can be moved easily along the project area. I was able to keep at a multi-day project every easily. Along with cleaning a deck, sidewalk, and driveway I cleaned mildew off of brick, gutters, etc. With the dispensing tank I like the fact I can use this to wash my vehicles or I can apply a vinyl cleaner to my siding too. Overall I am very pleased with my Generac pressure washer. Rated 5 out of 5 by Roki from Excellent Product! I have owned the Generac 7019 for 15 months and used it exactly twice: once the day I bought it in June of 2017, and again just this morning. The first time I tried to use it, I discovered the house spigot was leaking back into the basement, so I had to shelve the Generac 7019 until I got around to fixing the sillcock. As months went by, I worried that the pressure washer would deteriorate or "go bad" while sitting unused; I worried unnecessarily - this morning the Generac 7019 fired up on the first pull, and I used the heck out of that thing, cleaning many years' worth of grime off my siding and patio - I wore out before it did! I am very glad I went with Generac; the machine just WORKS, and the controls are labeled well enough that I didn't have to refer to the manual to reacquaint myself with its operation after more than a year. I would recommend this product to anyone in the market for a reliable, powerful, easy to use power washer. Rated 5 out of 5 by Javi from Excellent product Clean a deck that nobody took care of it in years, had a lot of mold in it. I start cleaning it with a electric power that broke down, I bought this Generac and I would say it did the job like a pro. I was able to finished quickly with this machine. If you need a good home power machine, this is a good one to get. I definitely recommend it. Rated 4 out of 5 by artur747 from this product is very powerful I have only used the pressure washer for two projects, but so far I am satisfied with the product. Easy assembly, startup on third pull, light weight for easy handling, and very powerful enough for all of my homeowner needs. OneWash Pressure Washer with PowerDial? Gun is rated 4.6 out of 5 by 45. Maximize your investment and maintain your Generac pressire washer with a variety of accessories.